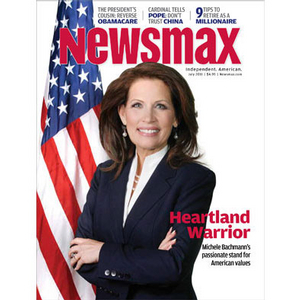 "Heartland Warrior" Michele Bachmann is surging in the polls after announcing her candidacy for the Republican presidential nomination in 2012 — and Newsmax magazine takes an in-depth look at her meteoric rise in political circles. Newsmax's feature "Rise of a True Believer" charts Bachmann's rapid ascent from federal tax attorney to conservative stay-at-home mom to GOP congresswoman and founder of the Tea Party Caucus. It's a rise that has taken Washington by surprise, bedeviled established Republican powerbrokers, and now threatens business-as-usual in the nation's capital. In an exclusive Newsmax interview, the three-term lawmaker — who has been called the "gold standard" of grassroots conservatism — says Washington is a "corrupt paradigm of government, whereby votes continually are bought rather than representatives voting the will of their constituents. That's the voice that's been missing at the table in Washington, D.C. — the people's voice. "And that's what this election is going to be about — who gets to be at that table." Why Bachmann is called "America's Thatcher"
Bachmann's charge: Obama is a "complete fraud"
Why we could "lose the nation for the next generation"
How America can be "on top of the world again"
Joe Scarborough targets Obama's "moment of truth"